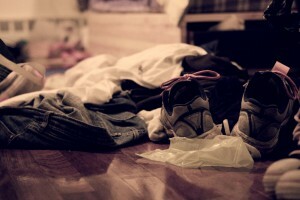 1) Declutter and remove 366 (or more) items from your home/apartment. 2) Items may be donated, sold, or given away to count towards the 366 item total. 4.) Items don’t count towards the 366 total until they actually leave the house. I’m going to concentrate on a few areas of my apartment and get rid of as much stuff as possible. 1) Bookcase – I have wayyyyy too many books, and many of them I don’t intend to read again. I do lend some out to friends, but that doesn’t happen as much as I hope. My bookcase is almost full now, so I’ll be looking to get rid of a few dozen books. 2) Closet – I have a pretty small closet (think the width of a bedroom door), but I’ve cluttered up the bottom of it with random clothing and shoes that I rarely wear. I just need to get in there and toss this stuff quick. 3) Junk drawers – I have a few spots that are catch-alls for random stuff like power cords, mail, and other things. Much of this stuff can probably be thrown away, but there are some useable items that I just don’t use. 4) Storage areas. I’ve been living in the same apartment for nearly a year now, and there’s some stuff in storage that hasn’t been touched since I moved in. It’s probably a longshot that I’ll ever need or want to use these things again, so I might as well toss em. 1) Sell on eBay. I prefer this method for items that are worth at least $30 and are easy to ship. I feel I get the best return in price with the least amount of time and stress needed. 2) Sell on Craigslist. This works best with things that I can’t ship. I’m not a huge fan of responding to emails and meeting with potential buyers, but I’ve done it dozens of times in the past with good results. 3) Donate. Basically all of my clothes will go this route, along with a few other suitable items. I tend to just drop them off at Salvation Army or Savers (although they’re a few miles away and not owning a car makes this a little more difficult). 4) Curb it. This is my favorite method for getting rid of stuff fast. It might not be as useful as donating, but it’s still better than trashing perfectly good stuff. Basically all I do is put stuff out on the curb at my house with a “free” sign. Then I create a listing on Craigslist saying what I’ve put out and where it’s located (note: I purposely leave out my email address since I don’t want to bother responding to emails over free stuff). Oftentimes the things I put out are gone in as little as a half-hour. 5) Trash. I doubt very many things will make it into the trash (Yay! ), but it’s going to get thrown away if all else fails. 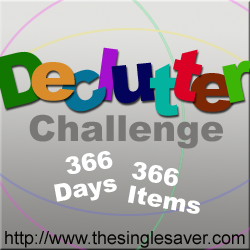 I encourage you to take the Declutter Challenge, too! I’m not even sure I own 366 things (nevermind have 366 items to declutter), but it will be a fun experiment nonetheless. I’m planning to host my first giveaway on Money Spruce to mark the one year blogiversary! Stay turned for more updates. My post on finally being debt free was featured in the Yakezie Carnival at the Ultimate Juggle this week. Source #1: Saving for the future and storing something that I don’t need now, but (I think) I might eventually need. Solution: Don’t save “just inc case” for unlikely future scenarios. Chances are if you jeans aren’t good enough to make the cut right now, they won’t make the cut in the future, either. I you do insist on saving, put a time limit on it (see below). Source #2: Buying multiples. Any time I buy more than I need at the current moment, and I may not need more until an indefinite amount of time later. Solution: Buy only what you need now and just pick up the rest later. Unless there’s a significant price break for loading up all at once, your space will just be cluttered by all the extras you have around. Source #3: Getting new stuff. This sounds like a stupid thing to have to say, but whenever I get something new, it increases the amount of things I already have. I find this is especially happens with gifts from others. Solution: Start a “one in, one out” policy. Got a new shirt? Toss an old one out at the same time. If you know you’ll never use something, don’t let it in at all. Sometimes I store new gifts for a bit then give it away, and that makes me feel less guilty. Source #4: Giving myself more storage space. This could range anywhere from buying more storage containers to keep stuff in the basement to renting out a remote storage unit to house all your junk. Solution: Don’t enable clutter. Before expanding your storage capacity, consider getting rid of anything that you can. A lot of times the stuff you put in storage never comes back out anyway. Solution: Force yourself to take action right away. Even if it’s just a bit at a time, it’ll make things better. Source #6: Not keeping track of things. This might mean buying and storing stuff, only to forget that you already own it. Or maybe you just can’t find it. Then you’re forced to buy it again. Solution: Keep what you need organized and keep clutter suppressed. When stuff gets crammed into places that are inaccessible or unseen, the likelihood that you’re going to remember that you have it stored somewhere is going to decrease. Source #7: Lack of clearing things out. Solution: Get rid of stuff when moving to a new house or apartment. You have to touch everything anyway, and it’s much easier to move with less stuff to pack and carry with you. Source #8: Lack of rules for getting rid of things. Solution: Set rules like donating clothes if they haven’t been worn for more than 6 months. This can easily be tracked by turning your hangars around when you wear something. The “one in, one out” policy is also a rule that can be followed strictly. As bad as I am about dealing with clutter sometimes, I do feel a huge relief when I finally have space to move around again. If you’ve had clutter for some time now, tak e care of it now. Just chip away a little bit at a time. You’d be surprised how much clutter you can take care of in only 10 minutes. Remember: Only you can defeat piles of clutter. Earlier this year I became fixated on a mission to get rid of most of what I own. This all happened when I discovered a concept that was new to me: minimalism. For those who are unfamiliar, minimalism basically means that you strive to own fewer things, have less of an impact on the world, and lead a simpler and more fulfilling life because of it. One of the more popular minimalist ideas out there is only owning 100 things. Feeling as though I had owned a lot all my life (I amassed large collections of CDs, books, DVDs, and other things before I graduated high school), my interest in lowering my “stuff” count strongly appealed to me. I immediately searched for things to unload. I picked on easy targets first, like clothing, extra office supplies, and books that I hadn’t touched in years. I even got to into larger and more valuable items, such as listing a bike on Craigslist and putting my clothing dresser on the curb. For a while, almost nothing within my grasp was safe. I successfully eliminated a lot of stuff and that felt great. After a bit, it grew more difficult for me to get rid of more. I’ll admit I never thought I’d make it down to only 100 things (at least at this stage in my life), but I did manage to get rid of several hundred items from my life. In reality, 100 things wasn’t the mission from the start. The real idea was to simply have only the things I need and get rid of the rest. More than 6 months later now, I’ll admit that I’m still not perfect when it comes to the random items I have laying around. Sometimes I do feel a sentimental attachment to random college mementos. Other times I literally don’t know what to do with stuff (like the stack of blankets in my closet), yet feel bad throwing it out. These types of things pose a challenge to my basic mantra of “if I don’t need it, get rid of it.” However, the transformation that I’ve gone through is definitely valuable and something that a majority of people could easily implement in their own lives. 1. Realize that it doesn’t matter how much you spent on an item in the past. It’s value to you now is what really matters. This is a classic case in almost everyone’s junk-filled lives. From my basic understanding of what economists refer to as “sunk costs,” the price you bought something for doesn’t matter after the purchase is made and can’t be undone. What really matters is the item’s value is to you now. Yes, you may have spent $120 on that leather bomber jacket in your closet. But if it hasn’t left the hanger in a couple years, it’s really not worth anything to you and should be sent of to Salvation Army. 2. Rely on your instincts in deciding if you truly need it. When I’m deciding what to get rid of one item at a time, I pick something up and then think about what immediately comes to mind. If I immediately decide it’s junk, I get rid of it and move on. If I know I need it or use it, I put it in a pile I will most likely keep it. If I hesitate, that usually indicates it’s something I think I might need but really don’t. Most people are probably biased towards keeping things rather than towards dumping them. To me, this is a simple way to recognize and conquer that bias. If you’re on the fence, it’s most likely not worth keeping. 3. If unsure, give yourself time to decide by putting the item aside and attempting life without it first. Once you know you no longer need it, toss it then. This goes with #2 and can be used on those middle-ground items. If you’re unsure that you really need it, store it somewhere out of plain sight but in a place you can remember. If you need it, you’ll know where it is. If a month goes by and it hasn’t been used, it should probably be thrown out. 4. Realize that you don’t need to keep every single item associated with every memory. Again, this one can be hard, especially for the sentimentalists. Perhaps it’s a doll you were given as a child or a souvenir from a trip you took. Whatever it is, you have some sort of emotional attachment to it. Let’s be realistic: you simply can’t keep everything that you have this attachment to. There’s simply no way to even keep track of all of these things. I know this may sound harsh but saving things in a box that you only come across every few years does not serve any value to you. Instead of keeping items as memories, find value in photos, videos, or journal entires instead. These can be at least as valuable as your item, but only take up space on your computer’s hard drive and not your closet. 5. If it can’t be sold for more than $20, don’t bother with it. I’ve sold lots of things on eBay and Craigslist that I didn’t need, and I’ve made a good deal of money doing this. But there’s been a lot of different stuff that has been difficult for me to sell. For example, I’ve had rugs or other small tables that just aren’t worth much in the second-hand market. I’ve put them on Craigslist only to get many tentative buyers that don’t come through or no real interest at all. Don’t waste time trying to sell things that don’t sell! My rule is if I don’t think I can get at least $20 for it, I don’t bother trying to sell it. It just isn’t worth my time (especially considering most people haggle anyway). If you have spare time, perhaps you can move your limit down to $10, but make sure you aren’t spending hours on menial sales. 6. Sell, donate, or give away stuff instead of trashing it. If you feel guilty about throwing things out, you’ll feel better knowing someone else will use them. Sell what you can or eBay or Craigslist. Salvation army takes just about all clothing plus a wide array of other items. If it’s still usable but selling or donating won’t do, put it out on the curb and advertise it on the “free stuff” area of Craigslist (I’ve literally had people pick up items within minutes of listing them online). All of these tips can be taken in small steps; there’s no need to tackle your whole house or apartment in one day. I recommend starting in easier areas, such as closets, storage areas, or junk drawers. In the end, the actual number of things you own doesn’t really matter. 100 is more or less a benchmark and useful for comparing what you own compared to others. It’s simple to find things to get rid of and you’ll feel the relief of having less clutter and more space for you instead of for your stuff.